It’s been a wild week. I’ve still been working hard and we are almost done with NFL Head Coach. On Tuesday, we had a wild event happen. We were awaken at 3:00 in the morning by our doorbell being rung. We looked outside and didn’t see anyone so we just figured it was some punk kids, so we went back to bed. We heard a loud bang and got up quickly to once again find no one at the front of our house. I then noticed that our recycle bins, which I had placed by the curb, were no longer there. I figured the bang I heard was the “punk kids” throwing them. Right as we were about to go to bed for a second time, we saw the neighbor from five houses down walking in the middle of the street with his shirt off. Jennifer called the Police and they shooed him back to his house. I went outside and found a recycle bin in our yard, but I don’t think it was ours because it didn’t have the same stuff in it. Also there was a strong smell of alcohol. That was when I saw a couple of wine bottles in our yard. With the Police here, we went back inside and went back to sleep. At 6:30 a.m. the girls were up and I was up making a bottle for Isabelle when the doorbell rang again. It was the neighbor who was wandering around last night. He said, “Do we have a problem?” and then accused us of breaking into his house. I said through the door that it wasn’t us and then he started yelling obstinacies at me. I held my ground while Jennifer once again called the Police. They arrived in a couple of minutes and arrested him. Once we went outside we saw the damage from the previous night. Apparently the big bang we heard was the guy taking the wine bottle and smashing it into the back of my car. 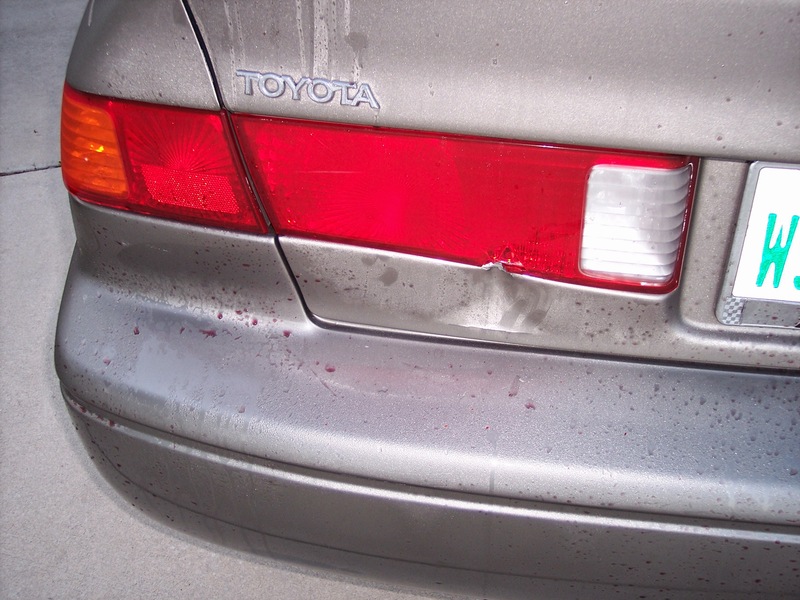 He made a grapefruit sized dent in the back of the trunk and poured wine all over the car and our mailbox. The Police said that he would be held for a 72 hour psyche evaluation. Later we found out more about him. His brother lives on our block and the brother’s wife told us that he is schizophrenic and that he hadn’t been taking his medication. We took the Camry in to get an estimate on the damage: $1000. Jennifer and I went that day to the courthouse in order to get a restraining order so that if he ever showed up, we could just call the Police. It was turned down since I guess he didn’t do enough damage. So, according to the brother’s wife, he’s going to be locked away for several more weeks. Hopefully he will take his medication and we won’t ever see him again. We are still stunned that all of this happened and hope nothing happens when he gets out. I will keep everyone updated.